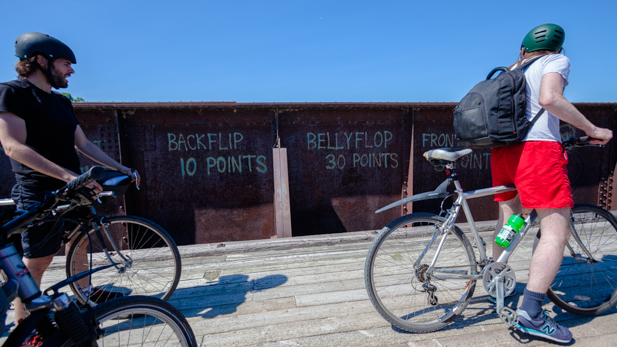 What’s the longest distance you’ve ever biked? 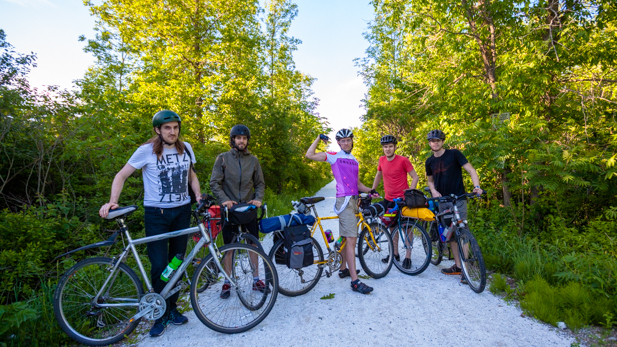 A few friends and I recently set off on a two-day, 200km (124 mile) self-supported bikepacking trip from Kingston to Ottawa. We biked almost entirely on trails on day one and then stuck to paved roads on day two which sacrificed chances to see unique scenery but saw a significant improvement on speed and comfort. Since we all live in Ottawa, we arranged a one-way van rental to get ourselves to Kingston which saved us some major hassles. 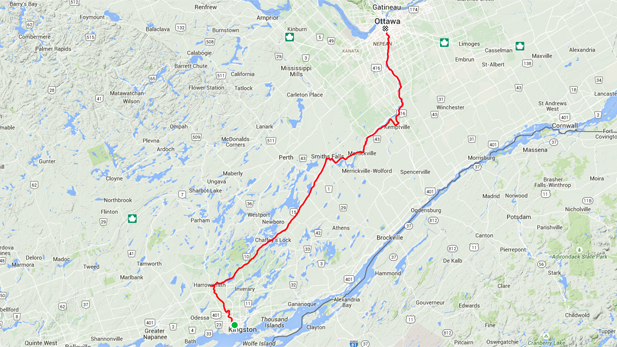 Map of our ride from Kingston to Ottawa. Click the image to see it on Strava. The gang’s all here. A section of the trail changed to gleaming quartz approaching Smiths Falls. After stretches of wet grass and loose pebbles, this might as well have been gold. Day one proved to be a rewarding challenge. 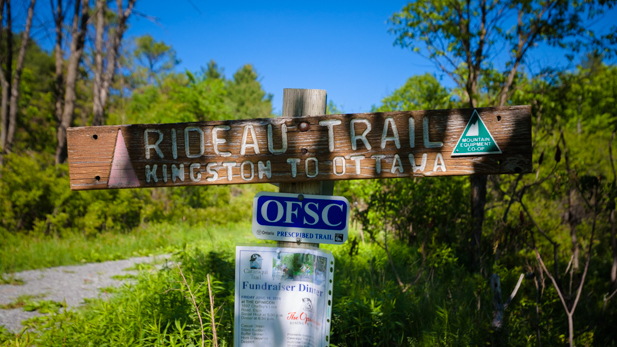 We covered the distance from Kingston to Smiths Falls using trails converted from old CPR & CN railroads that are now known as the K&P & Cataraqui trails. These partly share a path with the Trans-Canada Trail and the Rideau Trail and took us through an impressive variety of forest, swamps and rocky slopes (once blasted out by dynamite as part of the railway construction), providing a unique glimpse into Eastern Ontario’s topography. Taking it all in from our bicycles was a cool experience but the main challenge we faced was that the trail surface frequently changed from firm gravel to loose pebbles and soggy grass. For the trip, I used 1.75” Schwalbe Marathon tires and wouldn’t recommend any tire thinner than 32mm. One of us had 28mm tires which were ill suited to the trail. Having said that, since the route is mostly flat (277m elevation), it didn’t matter much that our bikes ranged from a 3-speed internal hub to a 21-speed. Thankfully, although we were prepared for one, no one got a flat tire! 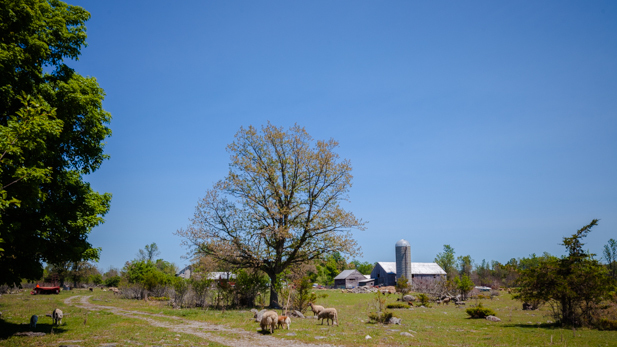 The K&P Trail travels beside and through a few farm fields. You can expect to see mostly horses and sheep. Another challenge: Poison ivy. Only one of us got hit (full disclosure: I was the only one. What’s the deal?). Anyone travelling through these trails should be aware that portions are lined with this horrific and unforgiving plant. I noticed that east and west of Chaffeys Lock, it grew very low to the ground and was difficult to spot. Lesson learned. As the saying goes, leaves of three…get the hell away! 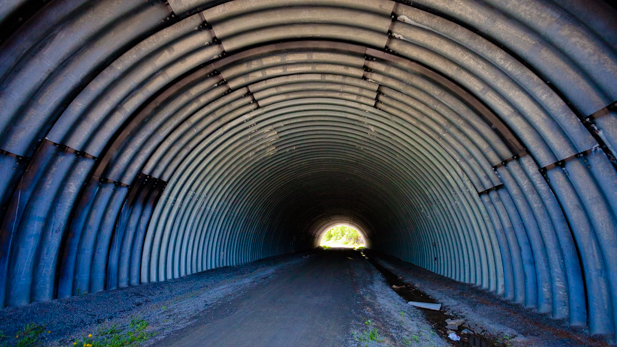 The K&P Trail passes under Highway 401 through this giant culvert. Not far into the Cataraqui Trail, we got to Sydenham, which has a supermarket, chip truck and park area right on the trail, making it a great lunch spot. This was going to be our last proper town before Smiths Falls, so we purchased a few fresh fruits. For its size, Sydenham and its lake are remarkably lively. Great spot for a day hike or a day on the water. The quartz section of the trail is gone but we are still en route to Smiths Falls. More marshy spots and the trail continues! Riding the trail, you can’t help but imagine the trains that once followed the same line. Some sections are so narrow that it’s amazing to think it was ever done at all. Along the way, there are a few good swimming spots, including at least one bridge that seems safe-ish for jumping. There are also some impressive views looking towards water – including one from an old CNR bridge at Chaffeys Lock that soars nearly 30 feet over the Rideau Canal below it. Be warned, even for the brave, this particular bridge isn’t for jumping. The water below is only about five feet deep. Matt & Nick are contemplating the possibility of jumping into inviting waters of Sydenham Lake. This is probably the only bridge that’s safe-ish to jump from. Local kids even developed a point system. Total Stand By Me moment here. Taking a quick break on the old 30′ high CN bridge that crosses the Rideau Canal at Chaffeys Lock, near the Opinicon Resort. Not safe for jumping. The water below is only about 5′ deep. After over riding over 100km of trail, we made it to Smiths Falls around sunset, stocked up on food at the Independent Grocer and set up camp at Old Slys Lockstation which is part of the Rideau Canal system managed by Parks Canada. It’s a little known fact that cyclists, paddlers, boaters & hikers can camp at most lockstations between Ottawa and Kingston for less than $5/night. Awesome deal for a quiet yet maintained spot that has running water and flush toilets. Depending on your needs, Smiths Falls also has a bunch of restaurants, bars and a few motels. You can even spend the night on an old train caboose at the Railway Museum of Eastern Ontario. Parks Canada maintains and operates the Rideau Canal, Ontario’s only UNESCO World Heritage site. 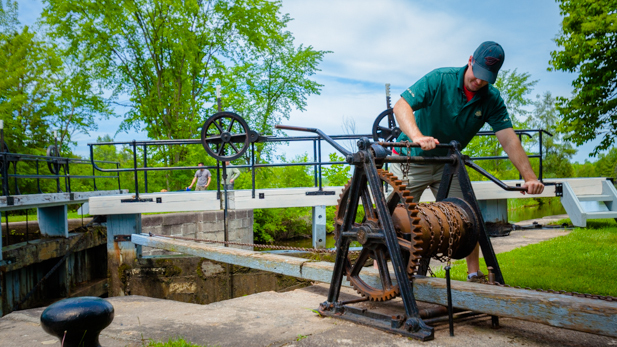 Each year, thousands of boats travel through the locks which are still hand operated the way they were when the canal opened in 1832. 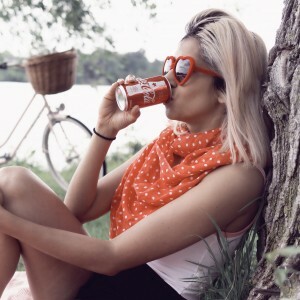 On day two, we used paved roads to get from Kingston to Ottawa, even keeping up with the Rideau Lakes Cycle Tour pelotons from our Merrickville ice cream stop until we split ways as we headed to Kemptville. Plan A was to take the new-ish 21km Osgoode Link Trail but we chose to stick to roads to save time. 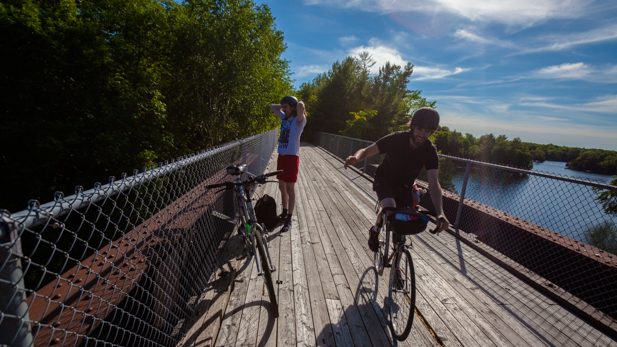 The Rideau Trail weaves across sections of the Cataraqui Trail. 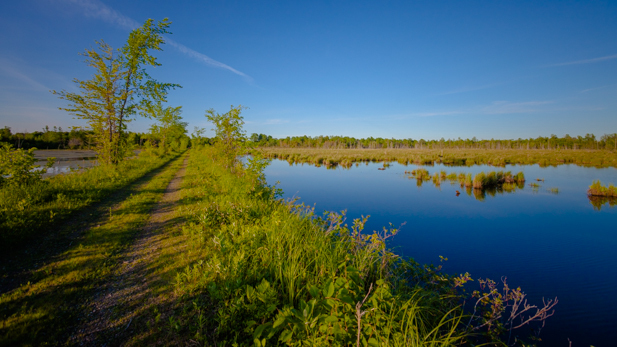 You’ll know you’re on the Rideau Trail when you see orange triangular trail markers. If you live in the area or if you’re looking for a unique Canadian adventure, definitely add this trip to your list. It is easily done in a weekend and there’s pretty much a route for every type of cyclist between both destinations. We posted our route to Strava if you want to check it out. 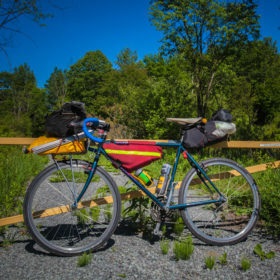 For inspiration, check out WarmShowers on Facebook and BicycleTouring on Reddit. Also, be sure to practice Leave No Trace principles. Trails are precious and fragile. Please respect them. 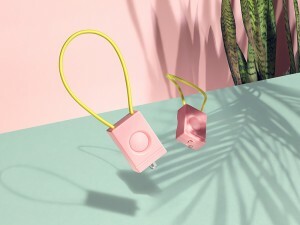 Perfect for keeping all your essentials close at hand. Kudos to Mash SF for releasing this series of water bottles paying tribute to some classic camera film. Durable touring tires that are favoured amongst long distance riders and known to last well over 10,000km. Easy to use and boils 800ml of water in about 2 minutes. Not your regular seat bag. Made in USA, this thing fits a stuff sack that can hold up to 14 litres. This little solar panel performed surprisingly well when strapped to a rear rack. It kept an iPhone alive while continuously tracking our course on Strava. Bugs can be an issue in this part of the country and this ultra light tent kept us well protected overnight without adding much weight to our bikes. Beautiful and instantly comfortable saddle. Perfect for long rides. Discreet SPD compatible sneaker. Works well on and off the bike. Lightweight clipless pedals at a good price. The pedals use proprietary cleats but they are compatible with 2-bolt SPD shoes.